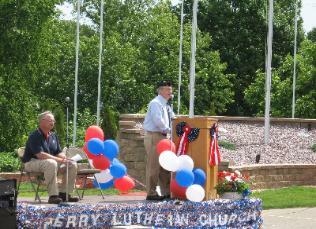 Perry Lutheran Church ELCA - Perry Historical Center Veterans Tribute Donations are still accepted for the Tribute Upkeep fund. 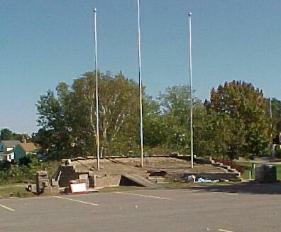 Funds will be used for the upkeep and replacement of flags. e-mail Kristin Brue @ bruek@mhtc.net or contact the Perry church office for details. Donations are still accepted for the Tribute Upkeep fund. 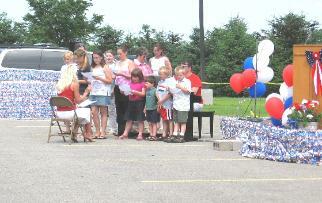 Funds will be used for the upkeep and replacement of flags. the Perry church office for details. 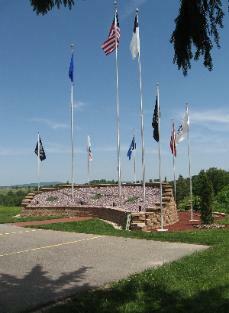 Begun in 2006 and completed in 2007 The Tribute to Veterans was financed by a bequest to PHC from the estate of Stephen and Joyce Ashman. It was designed and built by James and Betty Pankonian. 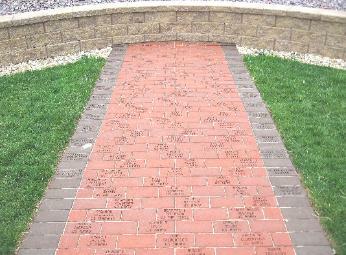 The brick walk to the Veterans Tribute honoring the lives of those who have served our country. 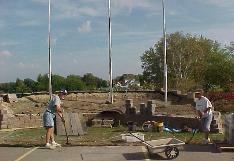 The main focus of the Historical Center this year was the completion of the Veterans' Tribute planned in 2006 by Jim Pankonien. We underwrote the cost of materials for the project using money from the bequest Joyce and Steve Ashman made to the PHC. Steve was a veteran of the Army Air Corp and this seemed an appropriate use of part of the gift. Special thanks to Jim Peterson and Ken Stamn who took care of so many of the details - especially ordering the engraved bricks. And thanks to those who purchased these bricks-a nice tribute to the servicemen. The flags also were donated by various individuals and Ernie Grinder has been our official "flag raiser" often a cold and windy job. 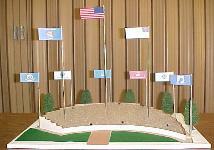 We welcome contributions from anyone who might like to purchase replacement flags. 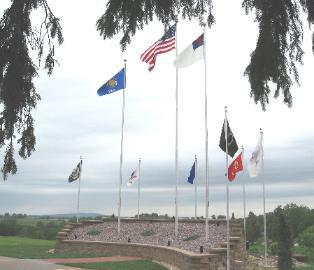 We have established a separate fund within Memorial and Gifts, which will be kept for the sole purpose of maintaining the Tribute, the flags, etc. 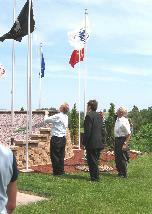 Following the completion of the Tribute, we planned the special Dedication in June. 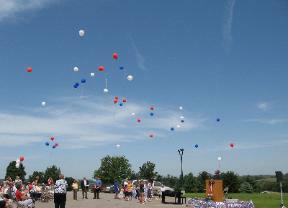 Blessed with beautiful weather, the day featured the Brass Quintet from the Army Band, speakers Keith Bakken and Jim Pankonien, the singing of patriotic songs both by the audience and the Sunday School children and a balloon rise of red, white and blue balloons. Gary Langfoss was Master of Ceremonies. 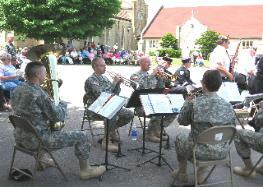 The Men in Mission served a noon lunch. A GREAT Day! 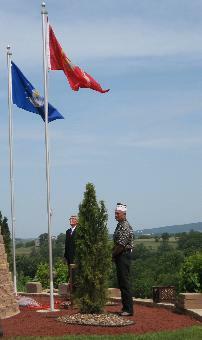 Flags from each branch of the armed services are raised in memory of those who served. We are located 9 miles south of Mt. Horeb on Highway 78 south at the intersection of State Highway 78 and Dane County Highway A. We are wheelchair accessible.